Welcome and Thank you for visiting my online profile! I originally designed and set up this website as an experience profile soley with the intent to maintain a record of my outdoor experiences to help potential employers get a sense of who I am and what kind of experience I have in my field of work as an outdoor educator. It is more than a online resume, it is a great interactive and fun outlet to exemplify and share with the world, my passion & enthusiasm for what I do. Family, friends, students, colleagues, acquaintances, new people I meet, or anyone web-surfing who might happen upon it can follow my adventures and projects through photos, videos, stories, descriptions, thoughts, learnings, or travel advice found in my posts. Similar to my educational philosophy with a lot of the work I do, I hope from browsing my website, you might be inspired to get out and explore beyond your own horizons. I grew up in southern Ontario, Canada in a town called Dundas just outside of Hamilton. I got introduced to the outdoors from camping trips with my family and scouts in the Great Lakes Region and Canadian Shield Country. These experiences inspired me to go to Lakehead University in Thunder Bay Ontario on the shores of Lake Superior. Here I completed a double honours bachelors degree program in Geography and Outdoor Recreation, Parks and Tourism. I’ve been working in a leadership role with youth in the outdoors since I was 17yrs old through scouts and different YMCA type camps. In 2004 I started working with Outward Bound(OB) in Ontario and immediately the philosophies and teaching practices stuck with me. In 2005 I made my first trip to the west coast of Canada as a student on a 30 day Outward Bound expedition course through the inlets of the sunshine coast and across the Pemberton Icefields. Since this pivotal time in my life I have been on a quest to build the skill and experience to become a passionate outdoor educator just like my inspirational instructors. This was a pivotal time because I then knew I wanted to work in the field of outdoor education so i started building more experience. In 2006 I spent a summer guiding sea kayak trips on Lake Superior in the town of Rossport, Ontario. Here I lived all summer in a small trailer with no power and no running water in a town of no more than 100 people with no one my age around. This allowed for me to spend a lot of time on my own, paddling around the islands in the Rossport Islands Archipelago on the central northern shore of Lake Superior. During this time, I thrived off spending lots of time on my own in the wilderness. Something about the simplicity of it has allowed my mind slow down, shut everything else off and heightening my senses, my awareness for the environment around me. It has resulted in a deep spiritual connection with water and landscapes first of Lake Superior but now everywhere I go. I discovered how introspective time like this is very valuable. When used with intention to make these connections, the possibilities and opportunities for growth are endless. Now that I have realized this I am excited to share it with everyone. Check out my LSRG page for more detailed information about some Lake Superior related projects that developed as a result of my excitement and passion to share these connections. 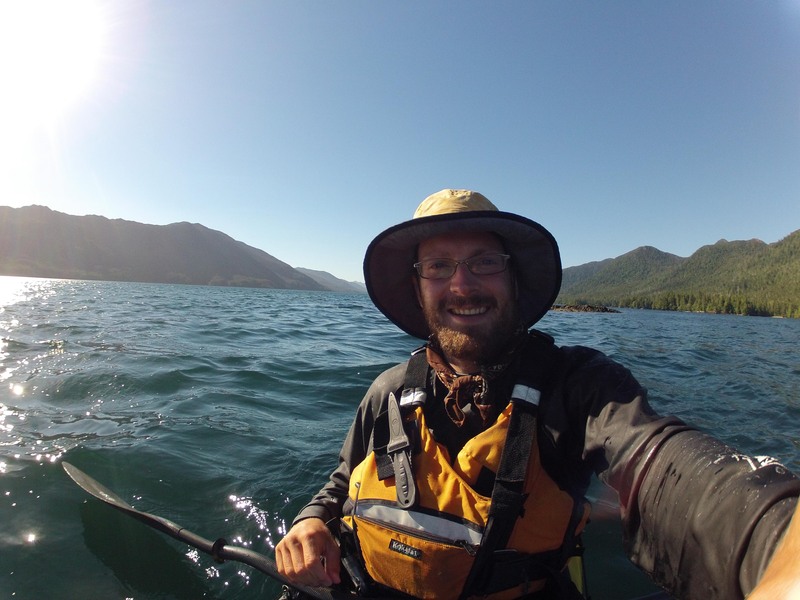 Between my the big 50 day student led sea kayaking expedition I completed on Lake Superior in 2007, I worked seasonal contracts instructing extended sea kayak and mountaineering expeditions with OB in Washington USA. Over the past 5 years or so I have traveled all over the world involving myself with meaningful and fulfilling life experiences from working with different outdoor education and guiding businesses to living with 6 other people on a 53ft ketch sailboat traveling the open ocean and remote islands of the central America and the south pacific to hitch-hiking the length of Chile and immersing myself in the humbling culture of the people in Aysen Patagonia to my most recent 40,000km road trip around Australia with my folding sea kayak in the back seat, free-lance outdoor ed instructing and paddling every chance I got. I have been on a constant path of flow, networking and building positive relationships with my colleagues, thriving off the supportive communities of like-minded people I meet, always striving to be the best I can by learning and growing while at the same time drawing off my experience to teach, share and inspire. I have experienced, learned, and been inspired an incredible amount from spending time with amazing, interesting, and passionate people. My family, friends, students, colleagues, both locals & travelers I meet have been my teachers – my inspiration, for whom I am forever grateful. Throughout my life I have been extremely fortunate to have the opportunity to travel and live the way I do. I’d like to thank these people who have given me so much inspiration through love, friendship, support, and guidance. Equally I would like to thank all of those whom I have shared adventures with however big or small they may have been, you have all inspired me to keep going. I don’t know if I would have been able to get where I am now without all you great people out there! I have always got some kind of adventure up my sleeves, whether through work, play or exploration. Once one is over i am in the midst of planning for the next. Keep checking for updates and you can find out all about where my current adventures have taken me. Something I am actively trying to do more of is let those people know how much they have inspired me whenever possible. There is nothing more rewarding or humbling when someone tells you how much you have inspired, supported, or helped them. I hope to give back as much as possible by being here as a resource with the information I put on my profile. So please comment on posts or ask me questions about anything and I can promise you I will go above and beyond to get back to you in as comprehensive and timely of a manner as possible. I am always intentional about making connections, building relationships and staying in contact. I hope I can do this through the website and eventually build an online community of like minded people all doing their part to help make this world a better place by having an open mind, absorbing and sharing the great energy around us. All thoughts and feedback, both positive and constructive are warmly welcomed and greatly appreciated. Stay in touch and I wish you all safe and happy travels, wherever life may take you. Hi Zack, thanks for all of the incredible photos. Hope things continue to go well on this wonderful journey of discovery and exploration of scenery, nature and wilderness. G’day Zack. My name is Rob and I met you and Tim on the beach at Cape Barren ( school principal ). Hope we get to hear and see more of your trip across Bass Strait. You certainly have inspired me, to the extent that I am now looking to buy a Mirage 580. I hope to be doing similar things to you by the end of he year. What a magic journey of adventure and exploration. Take care.